White Castle is undoubtedly the most impressive of the three castles of the Trilateral [Skenfrith, Grosmont and White Castle]. 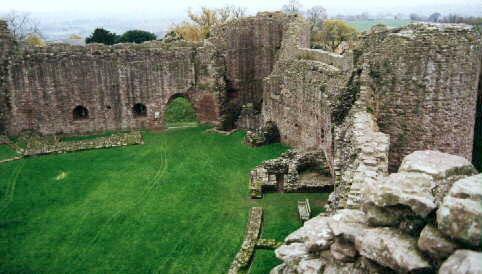 It may also be the oldest and was certainly the main fortress of the twelfth century barony of Grosmont. It was built on a hill with magnificent views to north, south and west and as such was clearly a military outpost for the barony and a watch post against the Welsh. 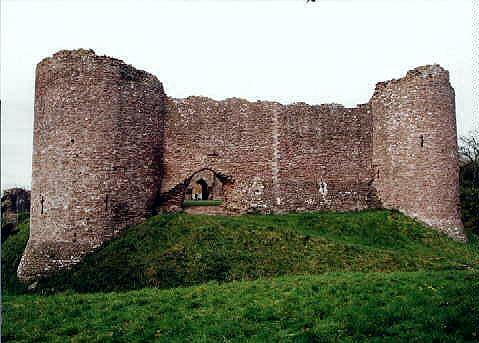 Quite possibly it was founded before 1075 when nearby Abergavenny Castle was probably commenced in the lower ground to the west. White Castle is surrounded by formidable wet moats which alone could have laughed any siege to scorn, not that one was ever attempted! 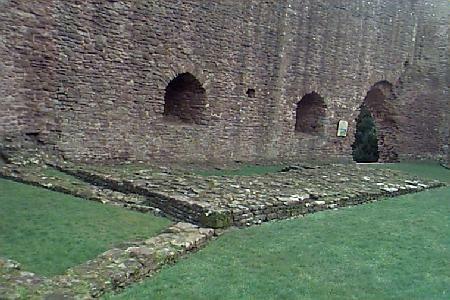 Clearly seen within the current remains are the foundations of an old square keep of the eleventh or twelfth century (shown above). This tower was demolished early in the Middle Ages and may have been of a similar construction and type to that still existing at Goodrich Castle. 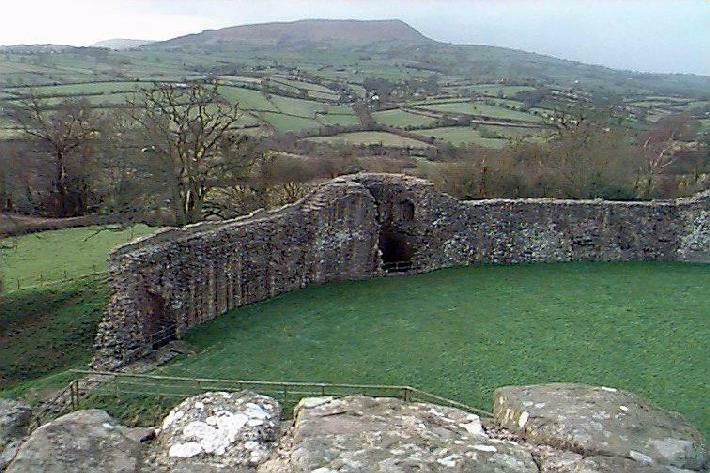 This early fortress may well have been the work of Earl William Fitz Osbern or his son, Roger, before 1075. The plan of this first castle appears similar to Usk castle to the south which may also have been founded by them. After 1075 the castle’s history followed that of Grosmont, the caput of the barony. 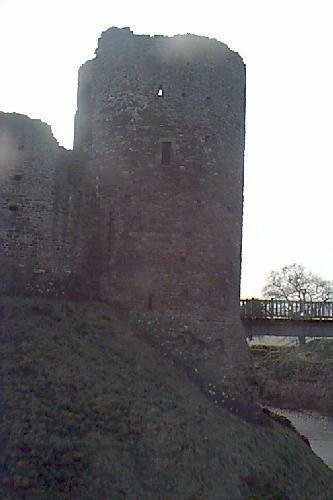 With renewed unrest in Wales after 1182 King Henry II ordered White Castle refortified. 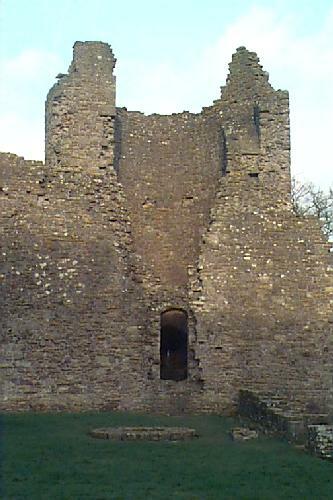 In 1185 the royal engineer Ralph Grosmont appears to have divided the first castle into two unequal parts, building the towering curtain wall which still survives around the inner, northern ward (photo above). There was probably also a gatehouse next to the original (now demolished) keep reached from the newly created hornwork, or southern section of the old bailey. The ditch between this hornwork and the inner castle is not as deep as that surrounding the whole defence and was obviously dug at a different time to the first moat. This work was finished in 1187 and the castle remained unaltered until 1229 when royal records show that Hubert Burgh began to alter the site. It was Earl Hubert Burgh of Kent who built the new twin-towered gatehouse to the north and reversed the orientation of the castle. It was because of this great new work that the castle ceased to be known as Llantilio Castle and took on its modern name of White Castle. Hubert also built new D-shaped towers to the east and west of Ralph Grosmont’s curtain wall (right). This building session was interrupted in 1232 when Hubert was arrested and dispossessed of his estates. Reinstated in 1234 he continued to work on the castle building the chapel tower and a new D-shaped ‘great tower’ to the south (below 1). He also demolished the old keep and built a new outer ward to the north (below 2). That this work was undertaken by Hubert and not later lords is demonstrated by the similarities between his work at White Castle and the defences of Skenfrith and Grosmont, and perhaps most importantly of all, those features still to be seen in the contemporary Montgomery Castle. King Henry III seized White Castle in 1239 when it must have looked much as it does today. Some internal work was carried out in the early 1240's and in 1438 the outer face of the north-eastern gatetower had to be rebuilt (photo below). Notice how the old arrowslits in this tower were not replaced. The other fine offset arrowslits built by Hubert Burgh are one of the treasures of the castle as too are its deep and impressive moats, so beautiful when full of daffodils in the Spring.